1983. 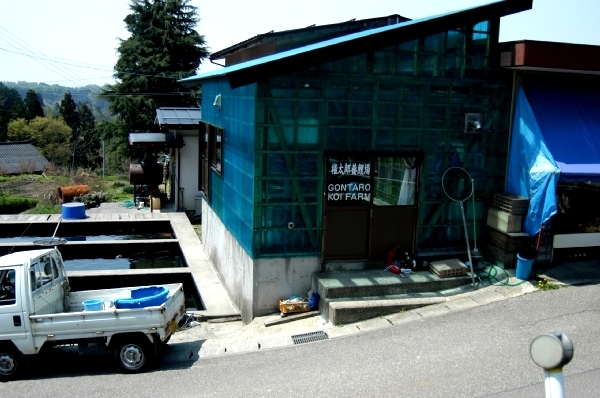 Gontaro Koi farm – Takezawa village. Kentaro Hoshino owns this outlet which is attached directly to his village store, operated by his wife, where we have often stopped to buy food and drinks ‘on the hoof’. Kentaro is always jovial and welcoming with a permanent beam on his face. He specialises in Matsunosuke Sanke which he breeds from the original lines produced many years ago by the late father of Toshio and Toshiyuki Sakai. He also produces some very good Kujaku with excellent lustre. My first impressions – ‘a genuine desire to please’.